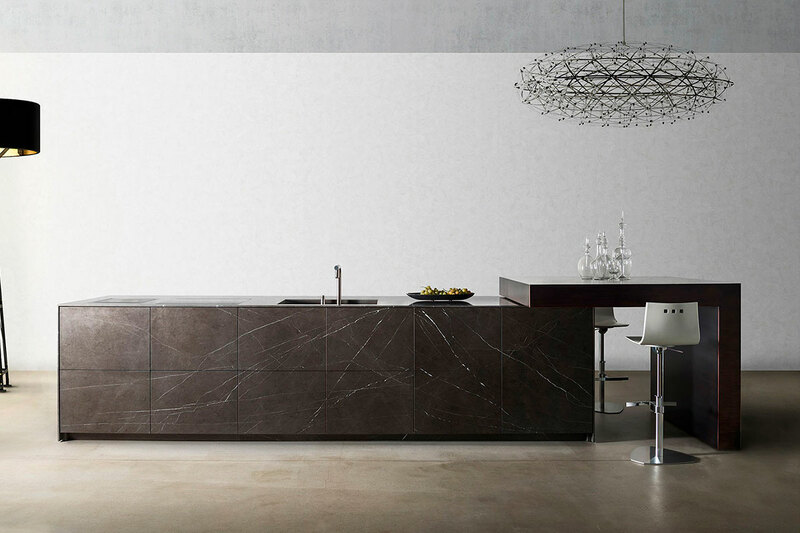 In any customized design kitchen, the choice of materials to be inflected according to the layout is always critical. TM Italia’s copper kitchens are endowed with a unique evocative power, an energy that matches with the advanced craftsmanship and technology typical of this company. Every result of each selection, rational and functional, is to be admired. Italian culture, knowledge in the materials manufacturing, high technical capability crown TM Italia’s realizations. 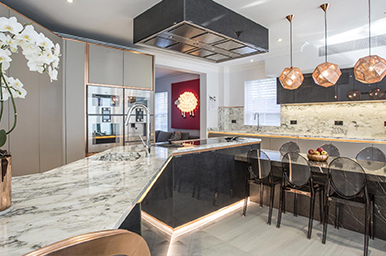 The choice of using copper for the design kitchens – or realized according to drawings – attract who is susceptible to the charm of the archetypes and the metals magnetism. 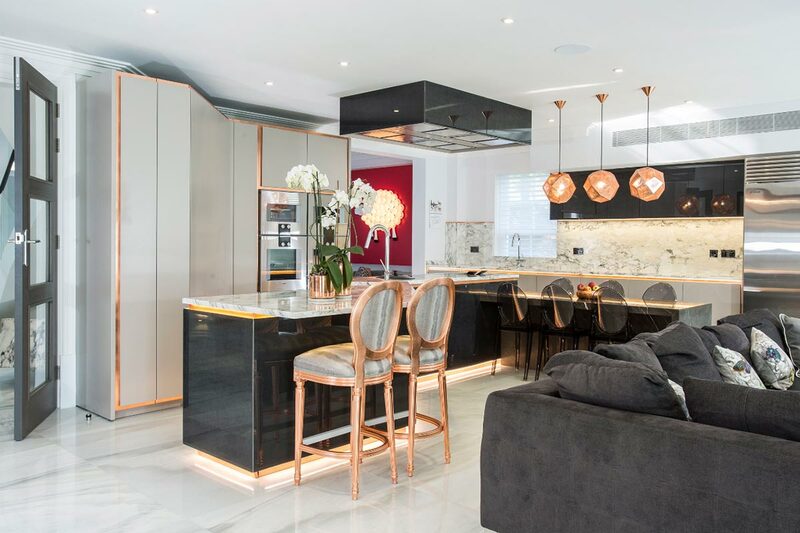 Place of conviviality and the house’s focal point, the copper kitchens highlights the value of the use of traditional and fine materials. Employed in trimmings with innovative solutions, on both tiny and wide surfaces, like workbenches or countertops equipped with electro-assisted scrollings, the copper sparkle wins the gaze even in the finishes and furniture. There are some perfect matches, materials that, when together, amplify the beauty and functionality of a TM Italia’s kitchen. 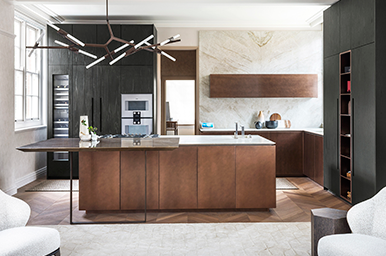 Copper kitchens are design solutions that express personality and uniqueness: the mix between stone and copper creates ancestral emotions of essentiality and elegance, like in one of the freestanding kitchens by TM Italia. 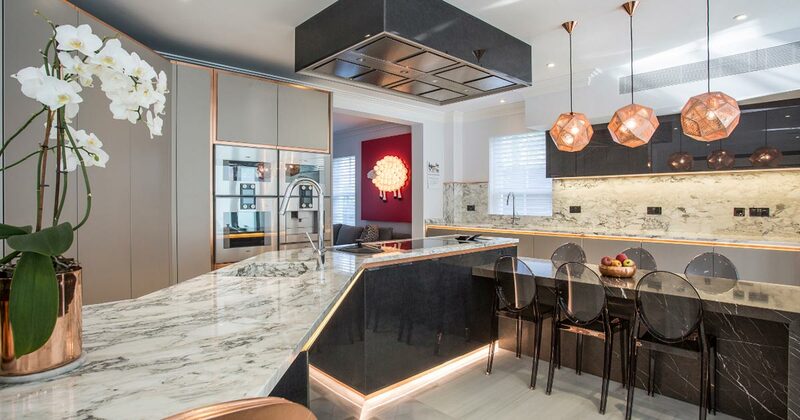 Otherwise, copper can be matched with marble, for kitchens that express a stronger sense of wholeness and splendor, thanks to islands customization and trimmings that tracks precise suggestions in the furniture’s completion. By increasing the selection of fine materials that TM Italia masterfully inserts in its customized solutions, an eclectic triad of copper, stone and wood essence can be reached, for a London-style realization, elegant and functional. 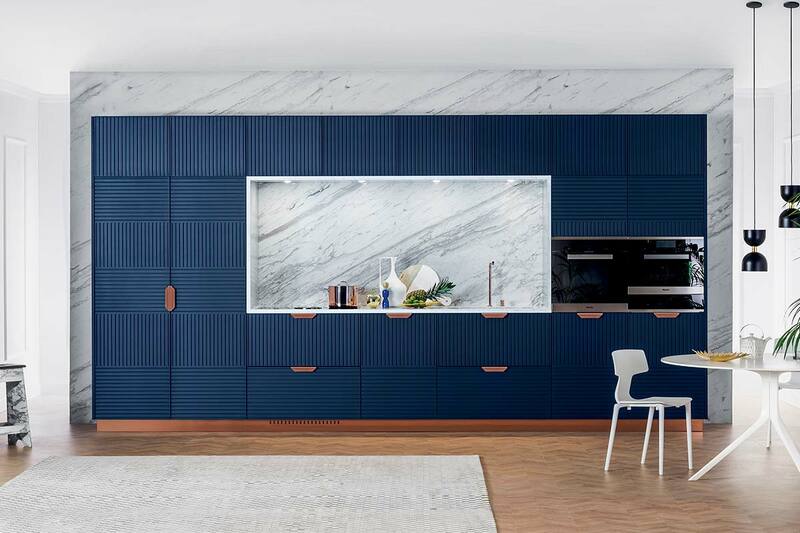 The shimmering metallic lacquering is suggested for big surfaces: the concept T30’s shutters for the island kitchens and the basis of this angular composition and the copper cabinets with shutters with vertical openings and LED lighting. 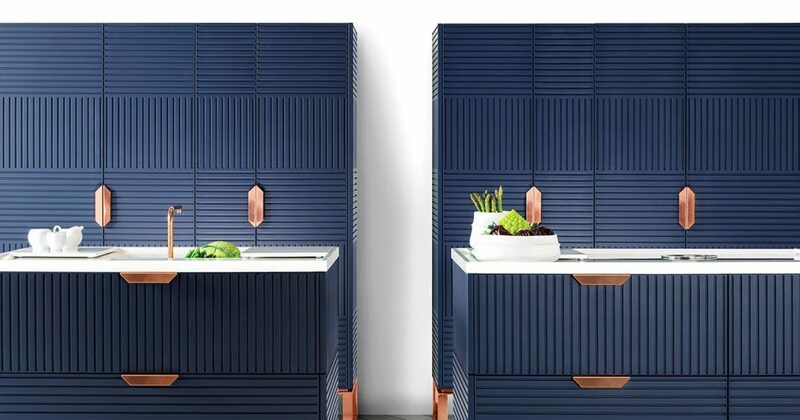 Cold when touched but warm at the sight, in TM Italia’s customized solutions’ copper always plays a fundamental role, both as the main character and as detail. 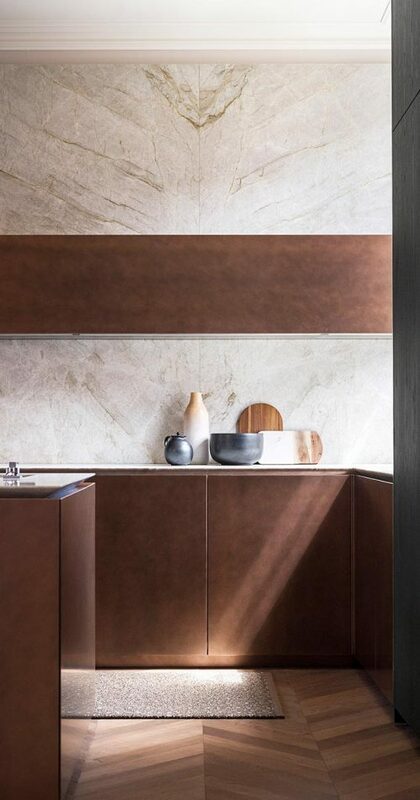 Copper kitchens are endowed with a particular trait provided from the quality of metal: also small glimpses that give metallic glares are studied for the different composition by TM Italia, in order to make the difference. The copper foil, used as a precious frame for shutters and the structure; the use of metal to characterize a kitchen that represents a homage to the craftsmanship of the Marche region, and the excellence loyally declared by TM Italia. 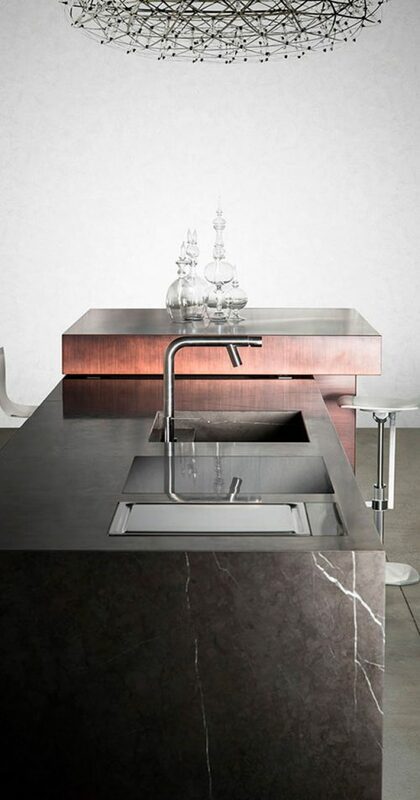 Therefore, copper is employed to enhance grips and bases, together with taps and fittings: a genial and elegant choice that expresses a sophisticated refinement, still suggesting traditional concepts. When projecting a design kitchen, an important characteristic is the one determined by the set of the employed materials. Not only due to the material composition, but also for the chromatic one, given by the nature of the chosen element and the matched finishing. For the copper kitchens, the metal can show particular nuances that allow a harmonic and impact chromatic framework, surely original. Just as an example, the burnished copper resembles the strength of the dark stone. The mix enhances the royalty of the geometrical shapes, purposely rigorous, almost monolithic, for a kitchen designed for installations in the middle of the room. 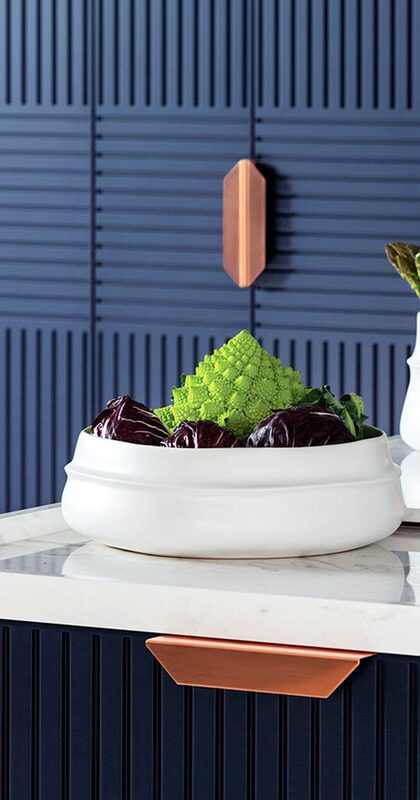 The copper’s ability to enhance craftsmanship solutions, evolved by TM Italia, appears in one of the realizations à la page – Miuccia – representing the classical culture, the Italian know-how, and the international style. Grips, bases, taps, and fittings with a pink copper effect stand out on the blue velvet finishing and harmonize near a natural stone in this linear composition with a great personality. 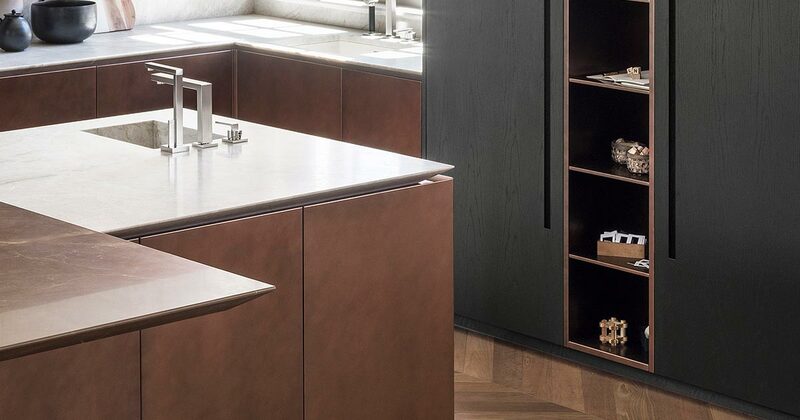 The copper kitchens give originality and refinement to every creation: from classic to cosmopolitan, from minimalist to the most detailed, the tailor-made solution of TM Italia always gives the right tone to the environment. 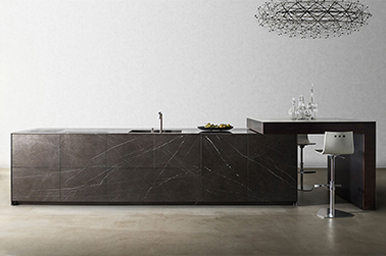 Subscribe to the newsletter and let yourself be inspired by the compositions signed by TM Italia for your next kitchen project. 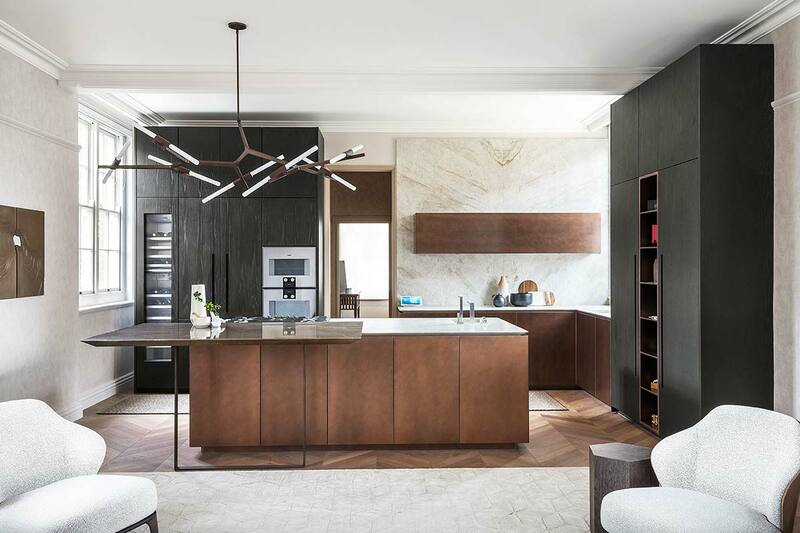 A kitchen with island and columns where strong and higly tactile materials like wood and stone, are enriched by the elegance of copper. The tailoring experience in applying industrial techniques to unique pieces makes TM Italia the ideal partner for every project.